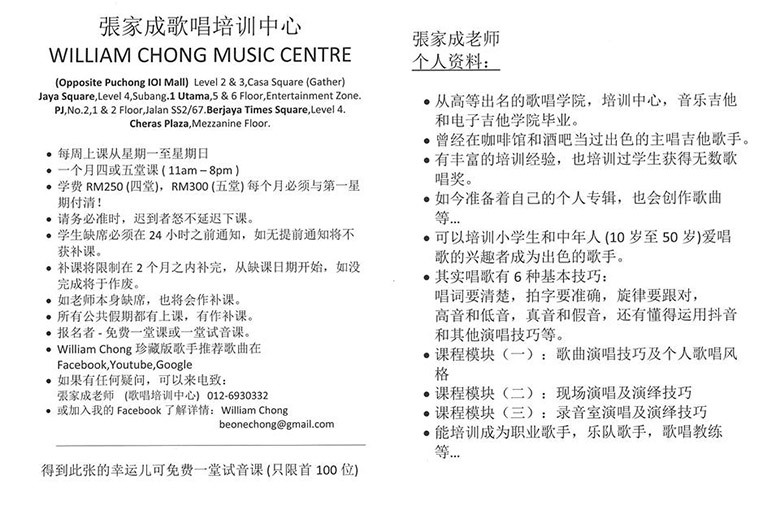 WILLIAM CHONG SINGING CLASS & MUSIC CENTRE & SCHOOL provides singing lessons to anyone who wants to learn singing. WILLIAM CHONG SINGING CLASS & MUSIC CENTRE & SCHOOL provides professional singing instructors that will guide you the correct technique for an excellent singing voice whilst exploring the styles of music you enjoy. The name of BEONE is the music title of WILLIAM CHONG SINGING CLASS & MUSIC CENTRE & SCHOOL. He likes to play rock music and different types of guitar. Now, he is preparing his new album and also creates the song. Besides that, he is also looking forward one day be able write a touching song to let every corner of the world full of warm sound to enjoy the beautiful music. He was been a good guitar singer in the cafe and bars, and he has rich experiences in trains and teaches their students to gained numerous singing awards. We make sure your singing dream will come true!